Brooms are the visiting card of a Russian bath. They create that unique atmosphere and spirit of a steam room. Without them, the steam room would be no different from a sauna. With the preparation of brooms and their use is associated a whole tradition. It would seem, what could be simpler than a blank? Cut branches about 60-65 cm long, tie and dry. However, in fact, there are some subtleties that preserve the aroma of the leaves and at the same time prevent the branches from falling. How to Knit Brooms Making brooms for a bath begins every year in a certain period. Typically, this is Trinity Day. It usually falls in the middle of June. 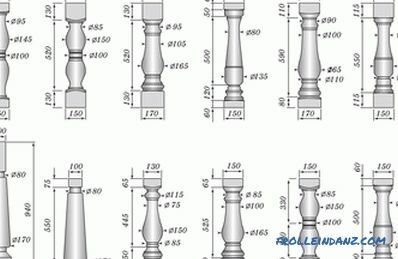 Before you do the workpiece, you need to pay attention to the weather. In wet times when it rains, the branches are not harvested. But the dew will be very favorable for the collection. It is better to choose the first half of the day for this event. This is the time when the dew barely disappeared from the vegetation. The question may arise: when to collect bath brooms, if it rains on the Trinity? If the weather is unfavorable, the procedure is postponed for a couple of days. Preparation for the procedure Brooms are certainly useful. They produce a massage effect. In addition, various substances that they contain have a positive effect on the body. The main condition is the ecological purity of the product. Collecting branches for brooms should be done outside the city, better - in the forest. If you can’t do it all yourself, you can buy ready-made ones. They are made in the countryside specially, observing the technology that the ancestors were guided by. These branches are most often used for mating. However, amateurs can add other branches to traditional brooms. It is known that for medicinal purposes it is possible to place nettle among oak branches. Combined can combine branches of oak, linden and birch. Birch broom in urban settings is the most popular . It is fragrant, has healing properties and is very gentle. Birch broom In order to make them, you need to choose the right tree. 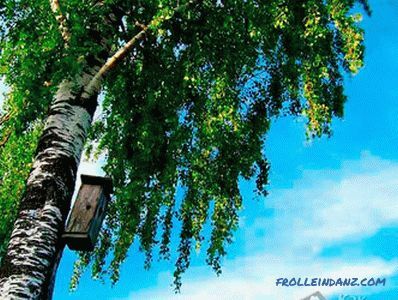 Experts recommend to pay attention to the so-called "weeping" birch. They have long, falling branches that lean toward the ground. Good brooms are obtained from young birch trees. Before the start of the collection you need to touch the leaves. From the outside they should be smooth and tender. If the surface of the leaves is rough, then it is better to find another tree. Thin and flexible branches - a guarantee of a good fragrant broom. 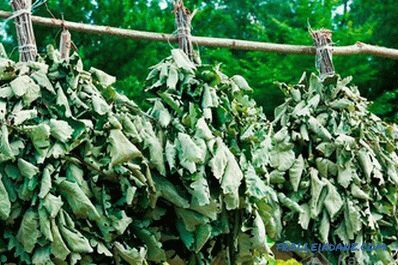 Before drying, the birch is not tied very tightly; there must be free space between the branches. Otherwise, the leaves may lose their quality and color. 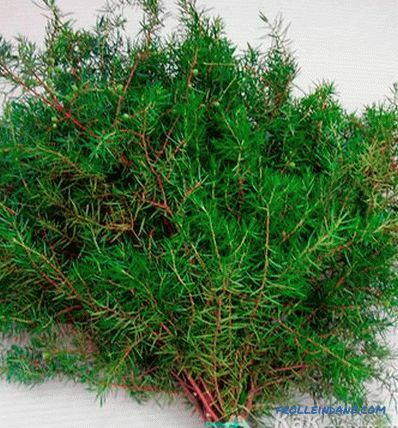 Juniper For a juniper broom, you need to collect the branches of this shrub, lovers of bath procedures know its value. The collection takes place in late spring and early summer. Juniper produces resins that have a beneficial effect on health. for flooring in the steam room. The harvesting of juniper branches lasts until the middle of summer. Before use, such brooms for half an hour steamed with boiling water so that they become suitable for a bath. 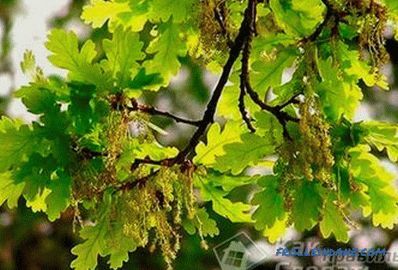 From oak branches Oak is a real classic along with birch. The branches of this tree are harvested in the second half of summer, more often in August-September. For this ideal young shoots. Oak brooms do not absorb sweat well, they are always dry. However, they almost do not fly around and are well suited for people with oily skin. Oak also helps with hypertension. 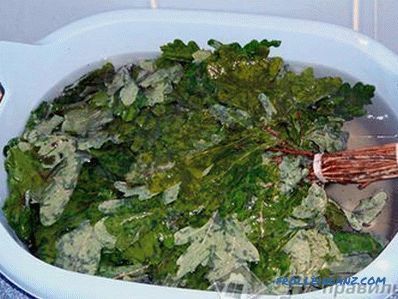 Tannins that are contained in this plant, perfectly clean the skin. Brooms from nettle. They do not burn the skin if properly prepared. When to harvest nettles? It is better to choose the period when the plant is still quite young. This time is from May to July. It is necessary to cut the shoots of nettle in clean terrain. In urban conditions, to find environmentally friendly thickets of this plant is difficult. Nettles growing along highways will not work. 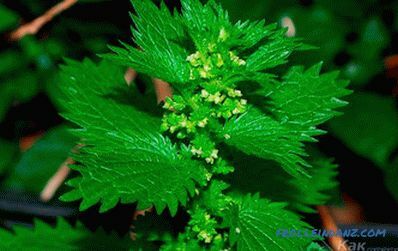 Nettle tones, relieves muscle pain, radiculitis and aching joints. In order not to burn the skin, it is necessary to dip a broom in boiling water and cold water two or three times.After that it can be safely used in the steam room. From Eucalyptus Eucalyptus harvesting time - end of July - August. Eucalyptus brooms perfectly serve to relieve various colds, relieve a cold, tone up. They also return women's health. 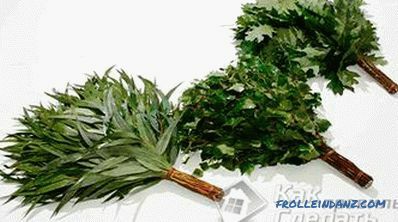 They are mainly used in the Caucasus, where it is easier to get eucalyptus. In Russia, such brooms can be bought. The aroma of this plant is unique. 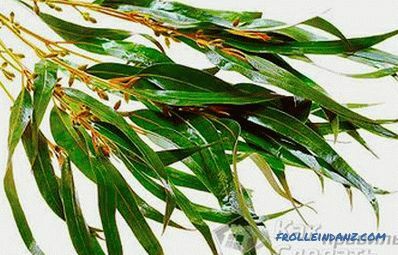 Eucalyptus branches are used not only for the bath, but also for medicinal purposes. For example, in the form of inhalation. 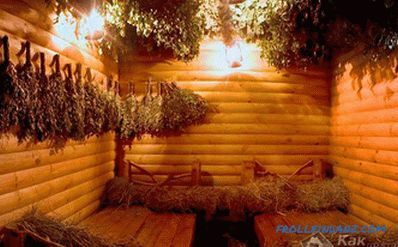 Wormwood brooms have long been popular in Russian saunas. This plant leaves a special aroma that cannot be compared with anything. Wormwood is also added to birch, nettle and oak brooms. Wormwood begins to collect during the flowering period. At this time, it is most useful. 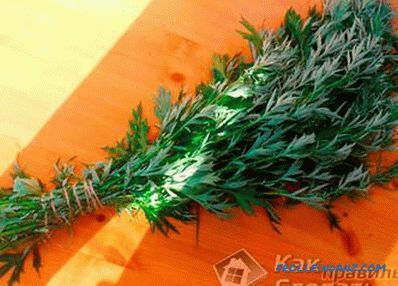 Dry the wormwood with bunches. Before drying, you need to check all the branches well. 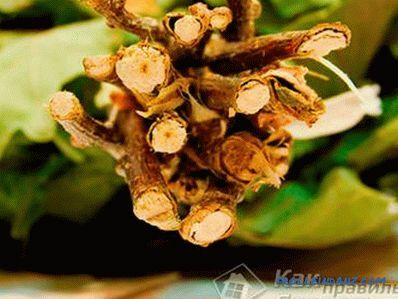 The first stage of drying occurs immediately after collection, when the branches are loosely tied, after going through and removing all defective ones. Then such bundles are hung on a rope or poles and left for a week. 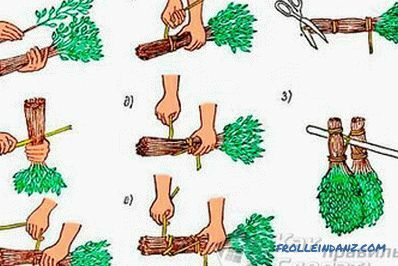 firmly grasping branches with your left hand, you must tie the handle with a twine as tightly as possible. After the binding is completed, it is necessary to make the proper packing for storage. It is better to put brooms one on another, so that later they take the form of a fan, not a broomstick. Products of this form - the highest quality, they are enough for about 3 times in the steam room. 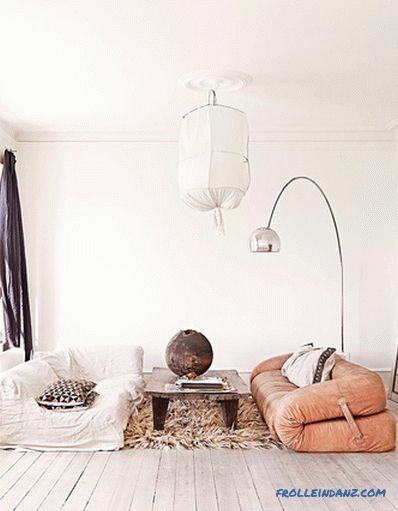 When the brooms are connected, the question arises how and where to store them. There are several storage methods. A dry dressing room is a good place to set up fresh brooms there. They are stacked on each other, and gradually flattened, their heads take the form of a fan. Can be stored in the attic by laying down hay. The main thing - that the place was dry and ventilated. In an urban setting, a good place to store is on a balcony or in a heated, ventilated garage. On the balcony they should be protected from moisture. During storage, brooms can be shifted by placing raw up dried down. As a result, the leaves should look green and smell fragrant. 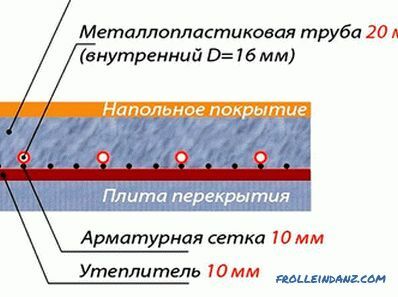 If the sheet has lost color, then the drying was performed incorrectly. Such products can be considered spoiled. 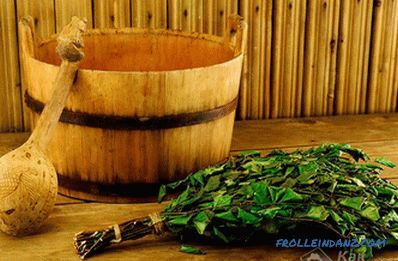 The history of the bath besom is also vague, as the history of the Russian bath. 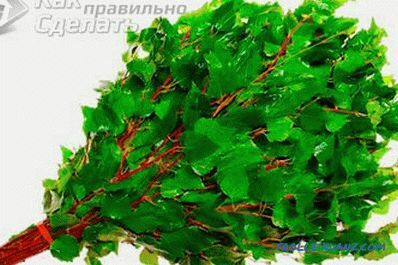 However, it is known that he began to be used by the Slavs, who believed that this “bouquet” of leaves doubles the benefits of the steam room and heals. 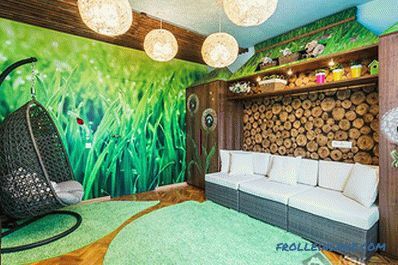 Two types are the most popular: oak and birch. They were considered curative. Healers used them for medical purposes to expel ailments. When in the West they decided to adopt the Russian steam tradition, they still could not fully embody it. First of all, not a single Western person could withstand such heat, which is so loved by Russians. And, secondly, only in the Russian bath remained a broom. 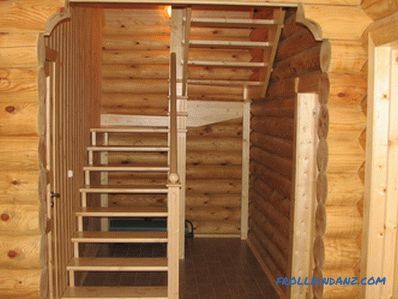 Brooms are not used in the sauna because it is impossible. The air there is too dry, and they just fly around. Some historians associate the appearance of the Russian bath with the Turkish. However, in no country is there a custom to steam with a broom. That is why this attribute is the distinguishing feature of the Russian pairs. 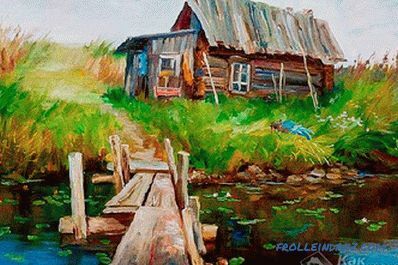 The tradition to bathe until the 19th century in the Russian outback was closely associated with various rites. For example, steamed after the wedding night. And the newlyweds took a bath together. Before visiting the church, too, soared. It was believed that the bath and a broom cleansed of sins.